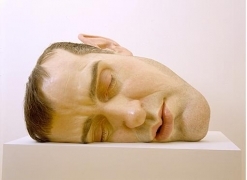 James Cohan Gallery is pleased to announce the first New York solo exhibition of London-based sculptor Ron Mueck. The exhibition will feature two new startlingly life-like sculptures: an oversized mask of a male figure in repose and a haunting and radical depiction of a mother and child in miniature. Mueck continues to capture unnerving aspects of the human psyche through his use of scale and acute attention to detail. Born in Melbourne, Australia in 1958, Mueck worked for children's television from 1979-1983. He then moved to London and worked on film and television projects such as Labryinth andThe Story Teller. In 1987 he started his own company in London creating animatronics and models for the advertising industry in Europe. 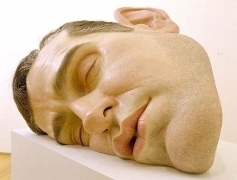 Mueck first came to the forefront of the British art scene in 1997 when several of his sculptures including Dead Dad were shown in the Royal Academy exhibition Sensation: Young British Artists from the Saatchi Collection. In 2000 he was awarded a two-year term as an artist-in-residence at the National Gallery in London. His sculptures are included in numerous private and public collections in the U.S. and Europe. Ron Mueck lives and works in London.